World at War runs off your donations! Help keep us going!! Welcome to World at War, Soldier! To get started at WaW take a look at the WaW FAQ. Complete the two steps below and follow the on screen instructions to sign up at WaW. 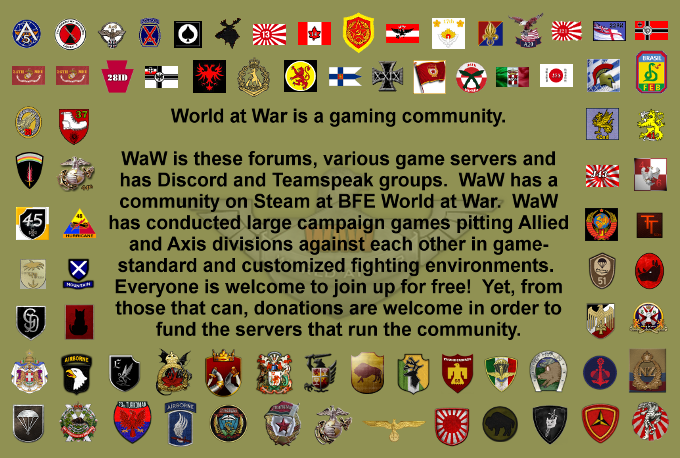 Step 1: Please begin by registering on the WaW forums by clicking the button below. Joining a Division Sorry, THERE IS NO CAMPAIGN at this time so there is no division to join. Step 2: Signups to a campaign are closed. World at War - Welcome!